Cholesteatomas are tumor like growths in the middle ear (see above). They are generally formed from the skin cells on the outside of the eardrum, that have become folded into the middle ear as a result of an ear infection with a perforation of the ear drum. Some are also congenital due to pockets of tissue located in the middle ear. A cholesteatoma may form a cyst within the middle ear consisting of squamous epithelium (skin), often containing cholesterol crystals. Presenting symptoms commonly include hearing loss on one side (of the conductive type), ear pain, and drainage. Dizziness is an occasional symptom. Damage to the middle and inner ear from a cholesteatoma is due to erosion and expansion of the cholesteatoma. This generally occurs gradually over years. Hearing is usually lost first as the cholesteatoma destroys the ossicles of the middle ear and fills the middle ear. Dizziness may occur if the cholesteatoma erodes into the inner ear -- for example, a cholesteatoma may break into the horizontal semicircular canal, causing an "otic capsule fistula". Most individuals with cholesteatoma will have a large number of abnormal ear tests. 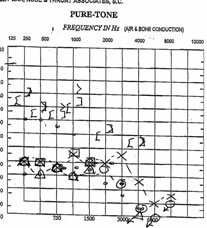 Audiograms -- usually will show a conductive hearing loss. The image above shows a conductive hearing loss on both sides, in a patient with bilateral cholesteatomas. Tympanograms -- usually will show a perforation of the ear drum. VEMP test -- usually is absent on the side of the cholesteatoma. MRI scan (see below) -- soft tissue is seen in the middle ear. This is not specific for cholesteatoma, but it is sensitive. T1 weighted 3T MRI using DWI (and contrast) is currently thought to be the most sensitive technique. (Steens, 2016). According to a meta-analysis of Muzaffar et al (2016), Diffusion weighted MRI is both sensitive and specific for detection of recurrent or residual cholesteatoma. Non-EPI techniques are superior to EPI. 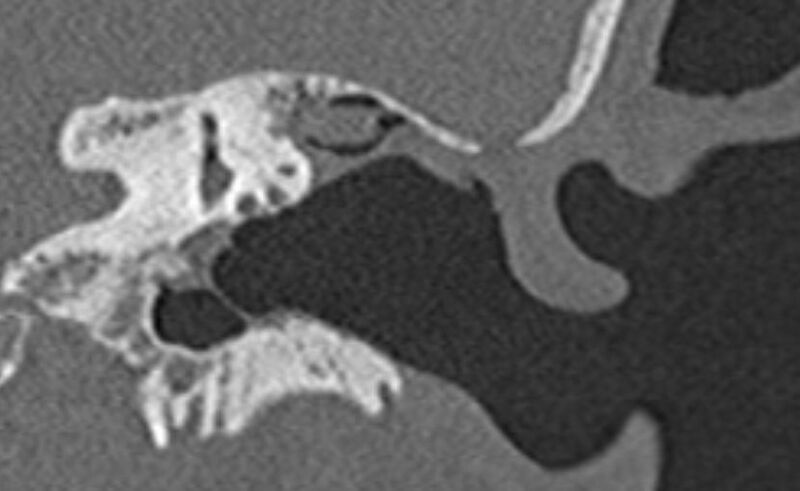 CT-scan of the temporal bone -- bony erosion may be seen of the temporal bone accompanying the soft tissue in the middle ear. The CT is the most specific test, but entails considerable radiation. When the diagnosis of cholesteatoma is already certain (perhaps one is looking for recurrence), DWI MRI may be the better choice. The coronal CT scan above was done on a patient after a mastoidectomy (canal wall down), and shows recurrent cholesteatoma. At the bedside, there should be an abnormal ear drum and a conductive hearing loss (which can be detected with tuning fork tests). Erosion of the cholesteatoma into the inner ear can be recognized by dizziness induced by pressure, provoked by the "Valsalva" test , or dizziness induced by sound provoked by the "Tullio" test. These are very specific findings. Surgery is the main treatment for cholesteatoma. An attempt is made to excise the inflammatory mass. In both of these surgeries the goal is to remove the "matrix" of inflammatory cells as well as to facilitate ongoing monitoring for recurrence. In the CWU mastoidectomy, the mastoid air cells including the cholesteatoma are removed, and the posterior wall of the external ear canal is left intact. In the CWD procedure the cholesteatoma is again removed and the posterior portion of the external ear canal is opened. 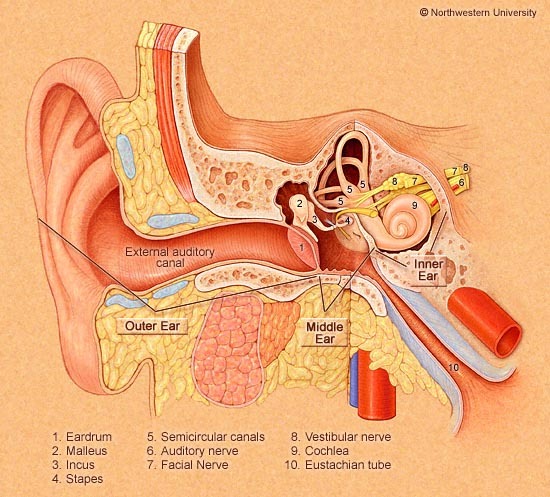 The opening of the external ear canal -- exteriorization -- requires periodic cleaning, typically every 6 months, for the rest of the patients life. It is generally thought that surgeries that provide greater exposure - - CWU, have less recurrence. In CWD surgeries, a recent study found residual cholesteatoma in about 20% (Haginomori et al, 2008). Lim et al (2016) recently reviewed 28 studies of surgical management of cholesteatoma with fistulae (a subgroup of cholesteatomas). They concluded that "There was no difference in hearing preservation detected between matrix removal and exteriorization ". Furthermore, "The level of evidence on which to base surgical decision making related to cholesteatomatous labyrinthine fistula is poor". Hearing usually improves by about 20 dB after surgery for cholesteatoma (Stankovic, 2008) Hearing is generally stable in persons after surgery, unless there is recurrence. In children, cholesteatoma has no long term effect on school performance for the majority who complete lower secondary school (Djurhuus et al, 2016). One wonders about the others who don't of course. Cholesteatoma's often recur, and repeat surgeries, called "revisions" are frequent. According to Li et al (2016), who reported on 76 revisions in China for CWD mastoids, the most common reason for revisions are "inadequate mastoidectomy or persistent air-cell disease (66/76 [86.8%]), recurrent or persistent cholesteatoma (44/76 [57.9%]), excessive opened cavity combined with complications (9/76 [11.8%]), and infected cavities (68/76 [89.5%]). " Knowing exactly where you are while attempting to remove a mass of tissue through a small opening can sometimes be very challenging, and occasionally mastoidectomies end up making holes where they are not intended. This can result in canal fistulae (e.g. between the horizontal canal and mastoid, and encephaloceles (herniation between the cranial vault and mastoid). These are generally fixed with more surgery, given that they are discovered. A brain herniation is shown above on this coronal MRI shown on the left, in a patient with bilateral cholesteatomas. On MRI scans, left is on right and right is on left. The brain is seen protruding into the mastoid on the left half of the picture (right temporal lobe). There is fluid in both mastoids. In the same patient, this image from a coronal CT scan (this scan is mirrored compared to MRI to the left), shows an opening in the bone through which brain can be seen herniating into the mastoid. It is possible to develop a brain abcess and/or seizures when brain is herniating into a cavity, possibly infected, such as the mastoid. When metal is used to repair a skull defect or mastoid defect into the cranial cavity, such as titanium mesh or plates, this can make follow up more challenging as it makes MRI imaging difficult if not impossible. Muzaffar J, Metcalfe C, Colley S, Coulson C.Diffusion Weighted Magnetic Resonance Imaging for Residual and Recurrent Cholesteatoma: A Systematic Review & Meta-Analysis. Clin Otolaryngol. 2016 Oct 4. doi: 10.1111/coa.12762. Steens, S., et al. (2016). "Repeated Postoperative Follow-up Diffusion-weighted Magnetic Resonance Imaging to Detect Residual or Recurrent Cholesteatoma." Otol Neurotol 37(4): 356-361.